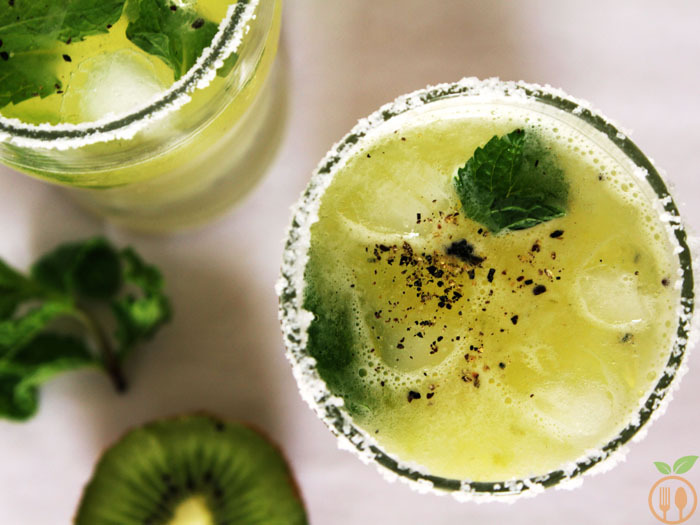 Don’t you think this Mint Kiwi Lemonade look refreshing drinks and perfect for these summer days ! 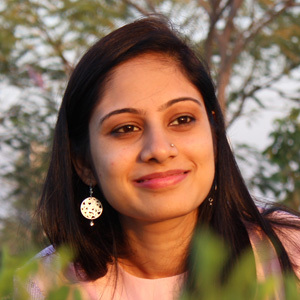 I have tried fruit juice and smoothie recipes since I have started my blog; it’s almost 3 months now. And I am struggling to create good drinks and smoothie recipes for my blog. I am strict minimalist when it comes to taste of recipe. If recipe looks fantastic but horrible in taste, I never share those (failures in my case) on blog, and visa versa. And when it comes to drinks (all time my favorite), I never compromise with its taste, then why you? Though, I have posted only one drink recipe Rose milk for valentine week in last three months which does not mean I give it up. And taste of kiwi is also combination of both fruits. It has sweet taste with hint of tang and it’s so refreshing as well. And at evening of summer, I had kiwi (as usual, I don’t like to eat any fruit as it is…) and I was trying to make lemonade from it. First I blend the kiwi and made kiwi pulp, and added it into lemonade. After I tasted it, I have added some rock salt and pinch of black pepper. I really loved it. And when I did photography of this drink, I immediately posted some pictures to my hubby (who was working in office that time). He was so impressed with that, he rushed to home with my favorite street food, and we enjoyed this drink with delicious “Dabeli” street food in my town. 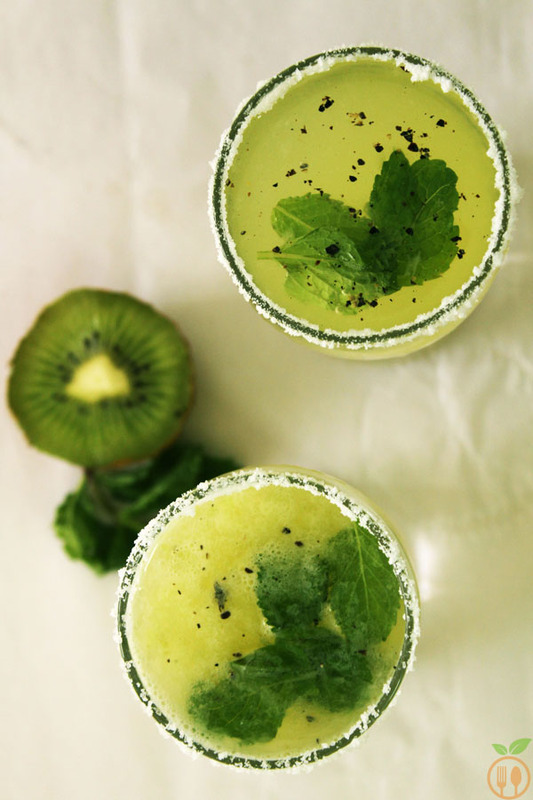 Mint Kiwi Lemonade look refreshing drinks and perfect for these summer days ! Peal the kiwi and cut into small pieces. Now in mixing bowl, add lemon juice and kiwi and ½ cup of water. Blend then using hand blender. Crush them into food processor. Now pour the drink into glass carefully, and add ice cubes as you want. (I used 3 ice cubes), garnish with fresh mint leaves and pinch of black pepper powder. You can serve this cooler drink with any appetizers. I am sure you may like this with street food. Kiwi must be perfectly ripe, otherwise lemonade is more savory and tangy. As I have used, kiwi pulp as it is. But you can strain this pulp, to remove seed. If you don’t like. You can use sugar syrup or sugar with substitute of honey. You can also use orange juice instead of lemon juice. 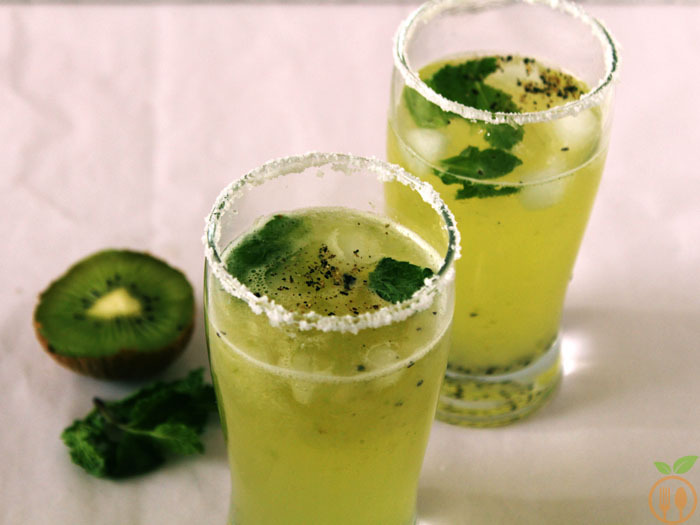 Not a fancy or complicated recipe, but very delightful and cool mint kiwi lemonade. Do try it for yourself and share your story with this recipe.